When you land at O’Hare airport and take the intra-airport rail system between terminals, colorful ad strips on the train urge you to come explore the city’s architecture. It’s a pretty rare city that explicitly promotes its architecture as one of its leading attractions. You might be surprised, then, at how casually the city throws its built environment away, even today. 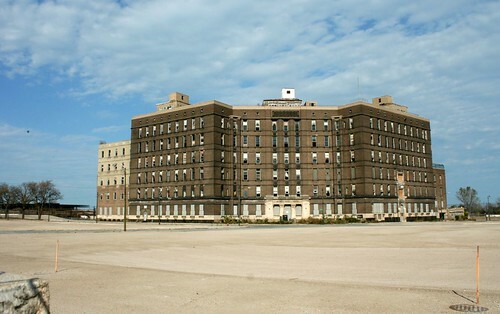 I’m referring, of course, to the recently announced backpedal by the Daley administration on saving the Prairie-style old Main Building at Michael Reese Hospital. Once heralded as the administration’s token gesture toward preservation of the once-dense complex, now it seems that a few break-ins and vandals are the flimsy excuse being used to justify tearing the place down. It’s nauseating, but who can honestly say they’re surprised? This entry was posted in Michael Reese Hospital. Bookmark the permalink. Not surprised, just saddened. The whole complex could have been fantastic apartments, but the city blew it.